It's just after Labor Day 2016 and the latest political polls don't look so good for Hillary Clinton. Because of her sometimes casual acquaintance with the truth regarding her e-mails, a megalomaniac who lies more frequently than he draws breath even when he's hyperventilating is leading in the polls, even though the only polls he should be leading in are the ones he uses to regularly vault over the truth. Why has Clinton stumbled so badly with respect to her e-mails? Hillary Clinton is a Boomer, just like you and me. When we were growing up the only mail we got was delivered by a middle aged man named Clifford who picked his teeth with our parents' telephone bill. Sure, we work our PCs and our cell phones today, but our understanding of their ins and outs equals our understanding of Justin Bieber's appeal. Unless America wakes up and gets this, we'll soon wind up with a man in the Oval Office whose most intelligent executive act will be to spin around in his desk chair, shout "WHEEEE!," and declare war on Pennsylvania. 1) Thinks "C" marking on documents means "Crap." 2) Believes "Bill Gates" is the name for proposed barrier to be built around her husband, and Monica Lewinsky will pay for it. 3) Constantly losing to Putin at Madden 2017. 4) Asked Russians to hack her e-mails so she can confirm date she unsubscribed to "Friends of NAFTA Weekly." 5) Has directed staff to remove suggestive "Insert" key from Bill's PC. 6) Not sure if "Spell Check" will determine accuracy of Hermione's and Ron's 's spells as well as Harry's. 7) Believes purpose of "Shift" key is to provide political wiggle room. 8) Has directed staff to remove suggestive "Enter" key from Bill's PC. 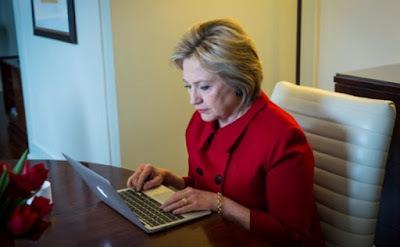 10) Thinks reboot means a change in footwear to go with latest pantsuit. 11) "Let's see, point and click, point and click, click and point .... Damn, I'll never get this right!" 12) Preparing critical outreach to emoji community. 13) Believes cloud computing is counting the clouds overhead to see how many look like pussycats. 14) Thinks Instagram is a website for drug dealers in a hurry. 15) "Delete" key, she understands. Yeah, I'm pretty sure that's what Instagram means as well. We're going to need that delete button I think; voters find Trump more trustworthy than Clinton? A man who lies two or three times within the same sentence? Boy, are we in trouble! Good luck getting Monica to pay for the Bill gates. After all, she was just taking care of a few domestic chores that Hillary didn't have time for. One more thing. You mean there's something out there besides AOL? Of course there is! You plug it into your telegraph and you don't have to tie up the phone.